Fiji is an incredibly HOT destination right now, with an excellent exchange rate, ultra exclusive private island resorts, a recent article featuring Wakaya Club in Conde Nast Traveler, and Oprah Winfrey’s recent visit to Laucala Island following her highly publicized Australian tour! While we all can’t travel like Oprah, Fiji offers small, intimate, all-inclusive luxury resorts for less than you may think! It’s actually more affordable and a similar itinerary will cost less than Tahiti in most cases. So, imagine my excitement to have been a part of this year’s Tourism Fiji Matai Familiarization Trip! As part of the Fiji Matai program, I not only get to learn all there is to know about Fiji- I get to visit there and see some incredible properties! You, of course, get to read all of the reviews upon my return. On this particular trip, I spent time in the Mamanuca Islands, as well as along the Coral Coast and on Denarau Island, which are both a part of the main island of Viti Levu. 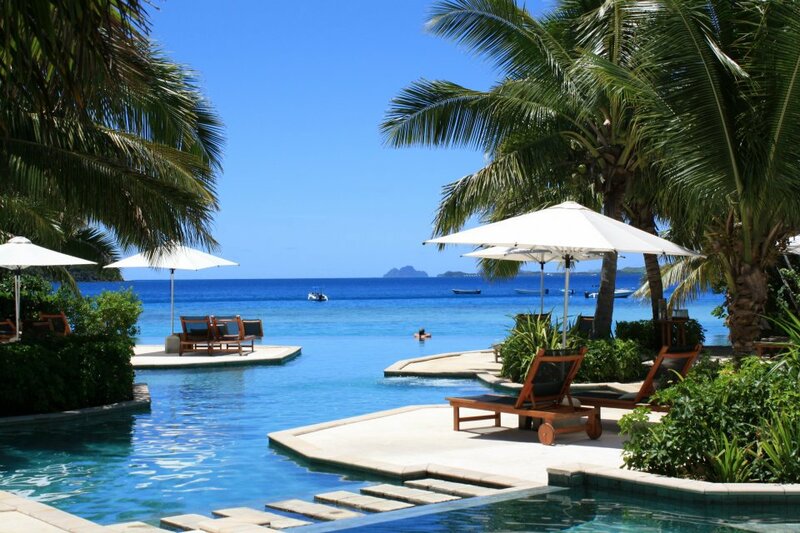 I had to opportunity to stay at Sonaisali Island Resort, Hilton Fiji Beach Resort, Castaway Island, Mana Island Resort, InterContinental Fiji Resort, the Outrigger on the Lagoon Resort and the Sheraton Nadi Resort. I also completed site inspections of the Hotel Novotel Nadi, Malolo Island, Likuliku Lagoon Resort,Tokoriki Resort, Shangri-La Resort, Sheraton Denarau Villas, the Westin Denarau Island Resort, and the Radisson Resort Fiji Denarau Island. As you can tell, it was a very productive trip and Tourism Fiji, along with the people of Fiji, were incredibly gracious hosts! The trip started with my usual hour plus delay getting into LAX courtesy of USAirways. I have learned my lesson by now and scheduled my flight to arrive into LAX 3 hours prior to our check-in time. When will USAirways ever learn? Hopefully, it will be when American Eagle starts their service from Phoenix to LAX in Spring 2011! Anyway, upon arrival into LA, I headed to TBIT and checked in with Air Pacific. Due to some recent medical issues with my back, I asked to upgrade to business class. Thankfully, there were seats available, though at the steep cost of $750USD one way. Anything to not arrive in pain. I upgraded again upon my return, which is apparently harder to do, but is actually less expensive due to the favorable exchange rate. The cost is 1100FJD, which was approximately $600USD (NOTE: Air Pacific does not offer a first class cabin, so business class is the highest available class of service.) Had I not upgraded, I would have had the option to sit in the “premium economy” cabin on the upper deck, which has fewer seats and is a bit more quiet, or on the lower deck, which has almost 70 rows. Both economy sections have a 3-4-3 configuration. The premium economy deck option can be purchased for an additional $300USD or so each way. Let’s just say that even with an upgraded seat in business class, I wasn’t all that impressed with Air Pacific. They need to do a major overhaul of their fleet for comfort because the 10 hour flight is a killer. That being said, with some Tylenol PM, Ambien, or whatever your sedative of choice may be, the 10 hour flight is worth it! After arriving into Nadi International Airport around 5:30am, I quickly sailed through customs (a perk of business class!) and headed to my awaiting transfer. All 32 agents and our wonderful guides piled onto the bus and we headed off to our first stop- the Novotel Nadi. From here on out, I’m going to try and just list the hotels, rather than write in paragraph form, as there are so many properties to review. They kept me quite busy, yet I heard that our group had the most laid back land-based itinerary! I’m going to be upfront and state that my first two reviews are a bit biased in that it turns out that I was a bit under the weather the first full day I was in Fiji, so I can’t be entirely fair to the properties. However, I was able to take the site tours, so I at least got see most, if not all, each hotels has to offer. Novotel Nadi: This property is a 3-3.5 star hotel located just minutes from the airport. It’s perfect for a day room if you just want to find a place to crash and/or clean up before heading on the rest of your journey and do not want to spend the extra money to stay at the fancier Denarau Island properties. The higher level room categories were closer to 4 star rooms and seemed clean and fairly up to date. The property has a few shops, a tennis court, meeting rooms, a large restaurant, a very small gym, and a small pool area. The gym needs the most upgrading out of the amenities offered, though i imagine it gets used the least. We only stayed at the Novotel to eat breakfast, freshen up, and then eat lunch before heading on to Sonaisali Island. The food quality was average, though we had a specially prepared buffet for lunch, so I cannot speak to the a la carte offerings. Plus, as I mentioned, I was not feeling well, so I did not eat very much to begin with. Hilton Fiji Beach Resort: Due to the winds from the cyclone that blew through in the days previous to our arrival, we had to cancel our Matai Conference and stay at Plantation Island and Musket Cove. So, at this point, the group of 32 agents split into two groups of 16 and went our separate ways. 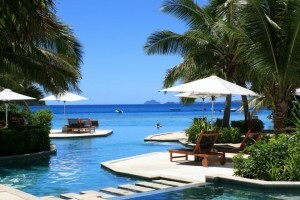 In place of the original itinerary, my group stayed at the Hilton Fiji Beach Resort, which is located on Denarau Island. Denarau Island is a small area separated from the main island of Viti Levu by a small river and is home to several larger chain resorts, as well as high end private homes. It’s also the location of the port where you embark to head out to the Mamanuca or Yasawa Islands, if you choose to get there via catamaran. The Hilton reminded me a lot of most large chain hotels on tropical islands. They try to blend in some of the local flavor, but it’s something you can also find in Hawaii or the Caribbean a lot closer to home. However, if you are a die-hard Hilton loyalist, I’m sure this hotel will fit the bill nicely for your stay. I just don’t recommend staying on Denarau Island for more than a night or two, as the true beauty of Fiji lies in the outer islands. The Hilton is large, as most chain resorts tend to be, and is broken up into several two story white buildings, most located along a pathway with views of the water and the beach. Two of the buildings have their own pools, but the resort has several rectangular shaped pools, including an adults-only pool. The rooms are fairly modern, with flat screen TVs and DVD players. One thing of note is that US DVDs will not play on most Fiji DVD players, so it may not be of use unless you rent a DVD from the hotel. The bathrooms are quite large, with a walk in shower, separate water closet (yes, I went there! ), and a soaking tub. The one thing I do not like about the bathroom were the sliding doors used to conceal the bathroom areas. The doors did not close all of the way, so it was a little awkward for us since we weren’t staying with our spouse, family, or even close friends. Outside of the rooms, the stairways need a bit of a facelift. The whole area is quite unattractive compared to the rest of the resort. It makes entering your room very uninviting. Right across from my room, which was located in building 10, is the spa. I attempted to get a massage appointment, but they were fully booked. As you walk back toward the lobby from either side of the resorts’ accommodations, you come across various shops. It is nice to have some variety in stores to browse, though none of them offered an ATM. Also of note, the Hilton is also one of the few places I was able to have all three meals. I was not impressed with the quality of the food or the service at lunch or dinner, but the breakfast buffet was very extensive. During our stay at the Hilton, we ventured outside of the property and Denarau Island to visit a local village and tour the Garden of the Sleeping Giant. When in Fiji, I highly encourage you to experience these two activities if at all possible. A village visit must be properly coordinated with your hotel, as you have to be invited on to the village grounds and must adhere to the rules of the village in regards to conduct and attire. However, your visit does not have to occur on the main island and experiencing an outer island village is perhaps a more culturally enriching experience. You obviously have to be on Nadi to visit the garden, so even if you have a long layover before returning back to the States, I recommend trying to walk the paths and enjoy the gorgeous and plentiful varieties of flora. The orchids are truly stunning. Our next stop was off to visit the properties in the Mamanucas! I’ll return to Denarau Island in a bit. Malolo Island: Malolo Island is located in the Mamanucas, adjacent to it’s sister property, the well known LikuLiku Lagoon Resort. Malolo is a blend of what I’ll call South Carolina cottage and tropical paradise. Strange, right? The beach cottages were not authentic Fijian or Polynesian, but rather something you would see in the United States in Hilton Head. The decor was simple, yet modern and clean. The cottages are built and laid out for families, as Malolo is child friendly. The path along the cottages reminded me of the walk through some of the Pearl Resort properties in Tahiti- trees and plants all lined up along the beach and slightly masking the water, which is a nice shade of crystal blue. The interior of the property is a little more authentic in appearance, with wooden decks and a pool surrounded by tropical flora. The food was tasty and we were able to eat in the shade. Malolo also has a kid’s club, which seemed to be filled with many activities to keep the little ones occupied. LikuLiku Lagoon Resort: Just a short ride from Malolo is LikuLiku. As you depart Malolo, you can look out on Wadigi Island, which can be rented out in its entirety, but if that is too much for you, LikuLiku is a nice alternative. While Malolo allows families, LikuLiku restricts its guest list to those over 16 years of age. Once you step onto the property, you understand why. With exceptionally manicured grounds, stunning views from a gorgeous infinity pool, a gourmet all inclusive menu (drinks not included) and spacious, modern and yet authentic bures, this is a place for romance. 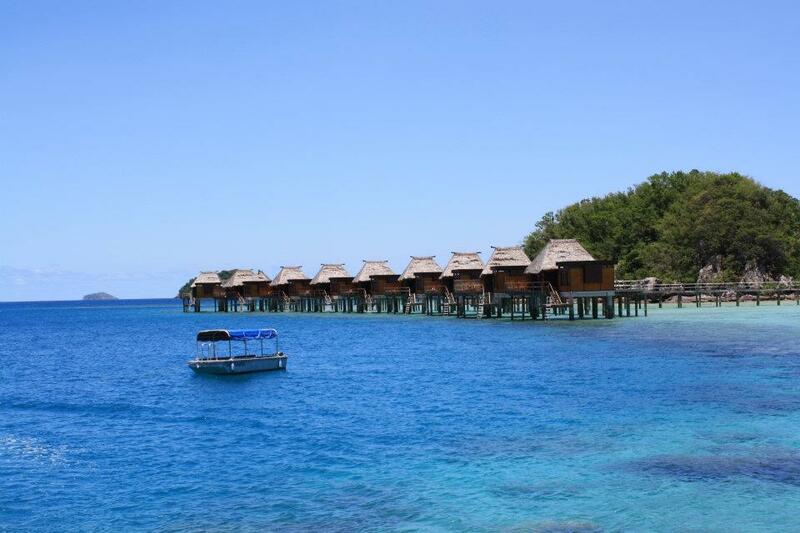 Better yet- LikuLiku is the only property in Fiji to have overwater bungalows/bures. While the overwater bures sit high from the lagoon and are affected by tides, these bures are expansive, well appointed, and come with an almost pallatable price tag of around $1500/night. That seems unreasonable, but it includes all meals and bottled water twice daily. Compared to Tahiti, it’s a steal. Plus, there are only 10 overwater bures, making it quiet and exclusive. If you can’t splurge for the overwater bures, be sure to look into the deluxe beach bures. Also spacious, these bures not only have killer views, but they also have private plunge pools! They are approximately $300USD less per night, but still offer a very special experience. Castaway Island: Not to be confused with nearby Monuriki Island, in which the movie ‘Castaway’ was filmed, Castaway Island is a private island resort that rolls up a friendly family experience and adventure in one! While I’m not one to brag about resorts that allow families, Castaway’s staff goes out of their way to make everyone feel at home, especially the little ones. While some people may shy away from something being so family friendly, Castaway is the perfect place to partake in water activities, hiking, and just indulging in food. 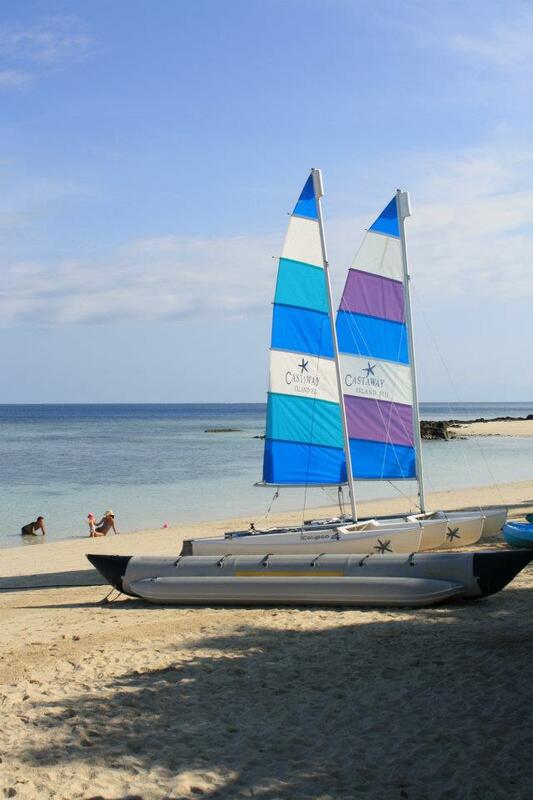 Castaway prides itself on offering some of the best water activities and excursions and they live up to that. Castaway is also unique in that you can hike all around the island- the resort owns it all- and maybe never see another soul. The resort has also added an adult pool and a massage area which is hidden within a thick tropical garden. As for the bures, they are the quintessential beach hut. With white walls and a thatched room, you really feel as if you are in paradise. The interiors are spacious and offer a blend of modern and authentic decor. The floors are a light colored tile, while the ceilings have a myriad of Fijian designs. There are several categories to choose from, as well- island bures along a garden path, ocean bures along the water, beach bures just steps from the main beach, or a family bure, which consists of two interconnected bures. Oh and the food! Before I move on, I have to complement the chef. There is a variety of cuisines and the breakfast buffet was the largest I have ever seen! For dinner, we had a Mongolian BBQ and it was delicious! Everything was prepared on the spot. Tokoriki Island Resort:Tokoriki Island Resort is a private slice of paradise (Tokoriki Island recently became home to the Sheraton Tokoriki, so the island now shares two resorts) tucked back off a beautiful stretch of beach. It’s more of a boutique property, as it’s small and very much focused on service with a huge Fijian smile. You will leave Tokoriki thinking the staff is your family. There are only 34 bures, all of which line a small cliff overlooking the beach. The bures come in three categories- Beachfront, Beachfront Pool Bure, or the Sunset Pool Villa. While all of the room categories are gorgeous, I’d recommend splurging on the beachfront pool bure. 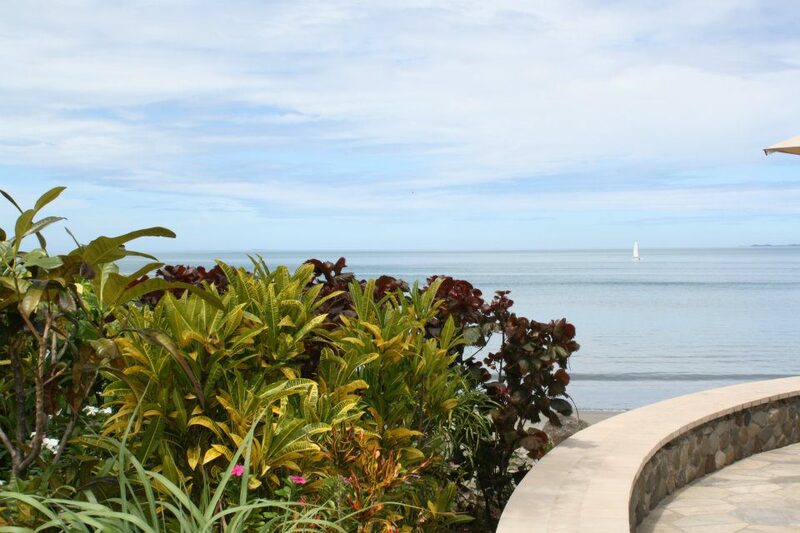 It’s the same size as the beachfront bure, but who can resist a private pool looking out over the blue waters? The Sunset Pool Villa is essentially two bures combined into one room, but it’s major feature is its location. You will get ultimate privacy in the villa. Tokoriki also has a simple yet gorgeous wooden chapel for weddings, which sits back from the beach among the gardens. The only drawback to this particular resort is that Tokoriki is not all-inclusive. However, the resort does offer meal plans and often offers generous resort credits to be used for food and drink. I also had the opportunity to visit the Shangri-La, Sheraton, Westin, and Radisson on the main island. These resorts are quite large, with the Sheraton Westin, and Radisson being perfect options as quick stop overs before heading out to the main islands. The Westin is the nicest and most traditional of the group. However, fun fact, the Shangri-La is used to film Hallmark movies that are based in Fiji! If you have any specific questions about these properties, please connect with me.